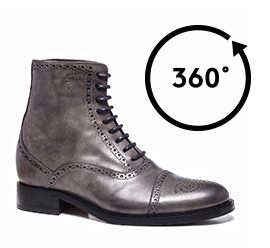 Reinterpretation of the classic elevator boots featuring upper in hand-buffered grey full grain leather with a characteristic "Brogue" design stamped by hand. The sole is made of real leather. The inner elevator system is able to increase height by up to 4 inches (10 cm). This model perfectly matches any casual outfit such as jeans, slim or regular fit trousers. The GM team of artisans and designers allows the possibility to customize every detail of the shoe to make it even more unique.